Calsonite® is a tough, durable external cladding. It is a reinforced concrete composite cladding material specifically developed by Monarch to maximise the benefits and performance of the Monarch Building System. With a dense surface layer, internal reinforcing and reflective foil backing, Calsonite® delivers benefits beyond those associated with traditional masonry. It is manufactured to strict quality standards. It is then robotically fastened offsite to a high tensile TRUECORE® steel frame to provide tough, durable external walls for residential homes which are installed onsite in a few days. A single, site applied acrylic render to the smooth external Calsonite® face provides the final, clean surface finish. Made of high tensile steel from BlueScope, Monarch Steel Framing is engineered to accommodate the unique aspects of the Monarch Building System including roof frame point loads and bracing requirements. Monarch Steel Framing is pre-punched to provide hold down locations, service holes and bolt attachments and is provided as a complete set of ready to install, pre-assembled frames and trusses. It comes with all necessary components, down to the last nut and bolt, allowing quick and easy installation. The 78mm wall frames also have a flush internal surface as a base for quality plasterboard finishes. Monarch Walls are a technologically advanced building material that enables simplicity and efficiency onsite as well as offering improved durability and quality of finish to builders of single and double storey homes and low-rise multi-residential buildings. Monarch Walls are manufactured offsite to suit your building design and specifications and installed onsite in under a week. They consist of a high tensile TRUEORE® steel frame, Monarch Calsonite® (Monarch's proprietary reinforced concrete cladding material), and custom designed G.James windows and sliding doors. The walls are specifically designed to speed up fit-out and the external finish of the cladding provides a smooth, flat surface ready for a single, site applied acrylic redner finish. Monarch Windows and Doors have been developed in conjunction with G James Glass and Aluminium. The combination of G James' quality engineering and Monarch's extensive design and testing over many years has resulted in a comprehensive range of common window options for the residential market. Monarch Windows and Doors have been developed in conjunction with G. James Glass and Aluminium. This collaboration has resulted in a comprehensive range of high quality window and sliding door options. 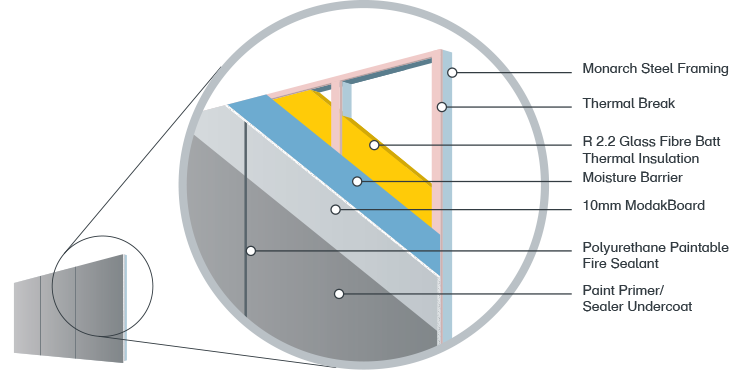 The full integration of the window and door range with Monarch Walls provides superior sealing which eliminates water ingress. 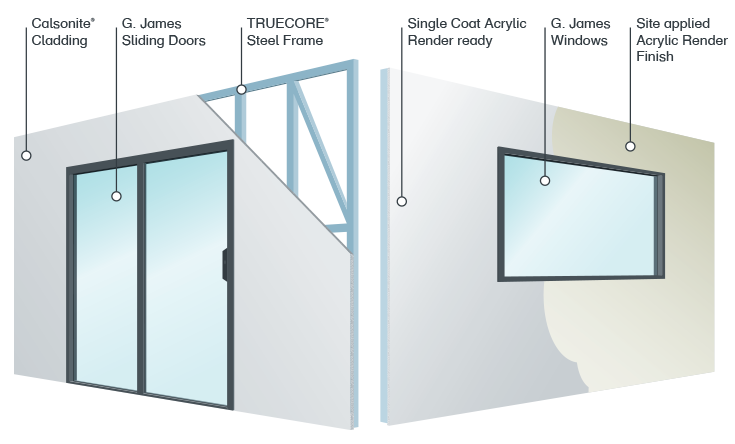 As a complete aluminium system, there is no timber frame, reveal or architraves to deteriorate over time. Made of high tensilte steel from BlueScope Steel, Monarch Roofs consist of a fully bolted roof frame comprising trusses, structural hips and valleys. rafters, purlins (as roof batterns), ceiling joists and soffit framing. It comes with a Colorbond® roof sheet package including insulation and rainwater goods. To enable efficient installation onsite, the trusses, rafters, hips, valleys, purlins and ceiling joists are engineered and manufactured with pre-punched connection points. The fully bolted system ensures positive connections are made at every location providing robust structural integrity. Truss spacings of up to 2400mm provide ample space for the installation of air conditioning duct work. Safety mesh over the purlins provides definite fall through protection for roofing installers. 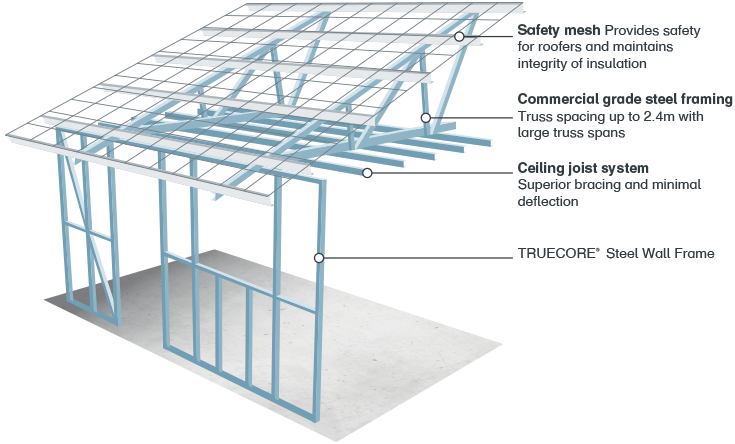 Monarch Floors consist of precision roll formed steel joists using high tensile steel from BlueScope Steel. Joists are custom manufactured and labelled to suit individual house design requirements. Brackets are designed and engineered for fast and easy connection of the joists to the external walls, internal support walls or bearers, depending on the application. Monarch External Fire Walls are designed for zero boundary lots where part of a residence is less than 900mm from the boundary. It consists of a fire rated external cladding, ModakBoard, which is robotically fastened to a commercial grade Monarch Steel Frame offsite and installed onsite in a matter of hours. The walls are 108mm thick excluding internal lining, and are custom produced up to 6700mm long and 3300mm high. A site applied top coat to the factory primed surface provides a clean surface finish. If you feel that we can assist you in any way with your enquiry please email, phone or email us for assistance. We look forward to welcoming you to superior building solutions from Monarch Building Systems.